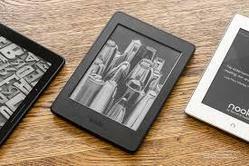 We are offering E Book Reader to our valuable clients. - The thinnest, lightest Kindle Paperwhite ever—300 ppi glare-free display, reads like real paper even in bright sunlight. -758 (212PPI) - increased by 62% compared to regular screen. Sharper and clearer display of images and contents. 16 gray scale; 180°visual angle ; More whiter background and blacker texts; more smooth refreshment. - Now with twice the storage - 8GB - store thousands of books so you can take your library with you. Wi-fi Kindle E Book Reader, Screen Size: 6"
UNIQUE Designer Series Synthetic PU Leather Case from OxyCase(TM). Don't settle for anything less, see what our unique designer case does to your safety and style of your Amazon Kindle PaperWhite . This case will surely get you the EYEBALLS. A sure-shot attention grabber with crisp and unique graphic, excellent quality print, high protection and yet slim. ADD to CART NOW to see it for yourself! 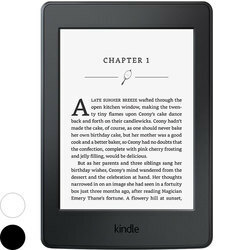 Kindle Basic (White), Memory Size: 4 GB, Screen Size: 6"